Roman shades are a very traditional window covering and have been around a very long time. 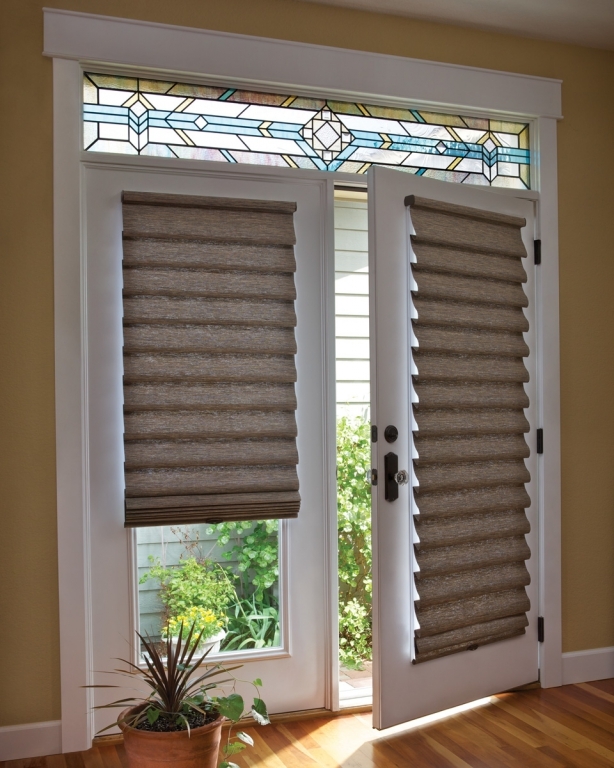 In this blog post, the design experts at 3 Blind Mice San Diego describe the most common options, styles and designs for Roman shades. Hobble shades are a traditional style characterized by soft fabric folds that cascade from top to bottom. Roman shades have no horizontal seams across the face of the fabric, making them them ideal for showing off stripes and other bold patterns. Roman shades with a batten front feature tubes of fabric with stiff strip of solid material, (wood, plastic or metal) sewn at regular intervals into the outward side of the shade. These Roman shades have the battens sewn into side facing the window (or door) and creates a delicate, refined look when down, and creates those traditional Roman shade folds when raised. An important aspect of Roman shades is the fabric. You can choose from a variety of fabrics: grasscloth, simple polyester, woven woods, cotton blend, and also a silk option. Based on the different fabric choices, price can be affected significantly. Another thing that alters the price in Roman shades significantly is how they’re made. With your simple Roman shade you have just a simple pull cord behind a fabric and a pull system. An economical version takes small strips of self lined fabric and use snap on battens to create the look. The more traditional and expensive style is a handmade Roman shade where you take the fabric and hand stitch on liners and inner linings; you have a much more durable batten systems and a heavier duty lifting system. Roman shades also come with numerous options of liners. No liners allow light to come through, making the fabric see through. The self-liner gives you privacy and allows light to come through. We can have a blackout liner attached, which allows no light to penetrate the fabric itself but creates the halo effect of light that comes through on either side. For those that want a little bit of both, we have the Infiniti option. With this you have the blackout option when the Roman shade is down, but, lets say that you need a little bit of light, while maintaining your privacy; you can raise the blackout shade and have a nice privacy liner behind it that lets light through. Once you don’t need the privacy anymore, and you’d like to have your beautiful San Diego view back, you can raise the bottom shade up and have the full view of your window. Those are some of your typical styles and options of a true Roman shade. Now we would like to introduce a new option called the modern Roman shade. With modern Roman shades you get a very similar look to that of a traditional Roman shade, however, they are completely different in the fact that they don’t fold. All of the modern shades roll up into a canister. The advantage of this is that you don’t have the stacking that you would have if you had a traditional Roman shade. On a modern Roman shade you end up with about 3 1/2 inches of stacking once the shade is inside of the canister. On a traditional Roman shade, the longer the window, the longer the stacking. It can range anywhere from about 6 inches to 16 inches. Another advantage of the modern Roman shade is the thickness of the fabric. A traditional Roman shade is fairly thick and has the liners to it. The modern Roman shade is very thin and light with a self liner attached to it that can be used for privacy or light control. One option you have with a modern Roman shade is the top down or bottom up option, where you can either lower the shade from the top of the window downwards, or you can raise it upwards like you would any other normal shade. You can do this on a traditional shade, but it is not as simple and as easy as with the modern option because of the stacking that you get with a traditional shade. When you raise the modern Roman shade up, it goes all the way up completely into the canister. The last thing about Roman shades is their control options. As we just went over, we have motorization options available. We also have a cord free version of it that allows you to raise and lower the shades by simply pushing the shade up or pulling it down with your hand. If you’re looking for something simple, we have our manual system. With a manual system, as you raise the shade, the cord gets longer. This is the most typical control of shades. You also have the top down, bottom up feature where you have two cords that can control the shade for you to make it go either down or up. We also have a system that is called a continuous cord loop. With this system, no matter where the shade is on the length of the shade, the cord length always stays the same. It’s very nice for large windows. Also, because it uses a clutch system, it makes very heavy shades easier to lift. We’ve also got a retractable cord system. Typically when you raise a shade, the cord gets longer. With our Ultraglide system, the cord retracts itself back into the head rail, keeping a nice, clean, sleek look, and no matter how wide the shade is or how many shades you have, all the cords look the same. Also, we have the twin option of having two different pulls for the two shades; you have the standard pull for the shade and your retractable cord for the liner. Still have questions or can’t decide which Roman shades are right for you? Ask our knowledgeable window covering consultants at 3 Blind Mice Window Coverings. They will help you to choose the best option for you. We also have a showroom located here in San Diego so you can also stop by to have a look at our wide selection of Roman shades and window treatments!